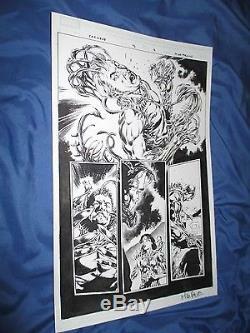 This is a very nice Carnage #13 original art page by Mike Perkins. 11" x 17" and is in excellent condition. PLEASE understand that it could be a few days before I respond to a question. READ AT THE BOTTOM ABOUT THIS. But some depending on the location in the country will go by parcel post. CGC provides a rigorous quality control process but like any company no one is perfect. Even so often the CGC cases may have a scuff or scratch on them. Even some of the sides of their cases are not snug tight on the sides. We have no control over the quality control process so the case may or may not be mint. If a book comes cracked and you are here in the U. You can send the book back to us and we will get it reholdered and sent back to you. PLEASE UNDERSTAND THIS SO YOU DON'T GET UPSET AND LEAVE ME 1'S & 2'S FOR MY DSR RATINGS. I APPRECIATE YOUR UNDERSTANDING OF THIS. THANK YOU SOO MUCH FOR YOUR PATIENCE AND UNDERSTANDING! PLEASE LEAVE ME 5 STAR RATINGS. The item "CARNAGE #13 Original Art Page #13 by Mike Perkins (Spiderman/Venom/Marvel)" is in sale since Thursday, June 01, 2017. This item is in the category "Collectibles\Comics\Original Comic Art\Interior Pages". The seller is "honestgrader" and is located in Lakeland, Florida. This item can be shipped to United States, Canada, United Kingdom, Denmark, Romania, Slovakia, Bulgaria, Czech republic, Finland, Hungary, Latvia, Lithuania, Malta, Estonia, Australia, Greece, Portugal, Cyprus, Slovenia, Japan, China, Sweden, South Korea, Indonesia, Taiwan, South africa, Thailand, Belgium, France, Hong Kong, Ireland, Netherlands, Poland, Spain, Italy, Germany, Austria, Russian federation, Israel, Mexico, New Zealand, Philippines, Singapore, Switzerland, Norway, Saudi arabia, Ukraine, United arab emirates, Qatar, Kuwait, Bahrain, Croatia, Malaysia, Brazil, Chile, Colombia, Costa rica, Panama, Trinidad and tobago, Guatemala, Honduras, Jamaica.